Mazatlan is located on the northwest coast of Mexico and is one of the most important cities of the state of Sinaloa. Mazatlan is divided in two areas: Old Mazatlan and Zona Dorada. Old Mazatlan is home to the historic city center, where you can find Machado Square. The Cathedral of the Immaculate Conception features Baroque architecture and it the most famous in the northwest of Mexico. Walk Republic Square and visit Ángela Peralta Theatre, featuring important cultural events. Other attractions include the Art Museum and the Archaeological Museum, among others. Zona Dorada is a tourist resort with hotels, shops, bars and restaurants that about half a century ago was known as the Shrimp Lagoon. The Pacific Pearl has several beaches where you can enjoy surfing, windsurfing, kayaking and paragliding. The liveliest is Gaviotas Beach. The Mazatlan Aquarium is one of the most complete aquariums in Latin America, with 52 ponds that are home to nearly 200 marine species, highlighting the Oceanic Fish Tank, the largest in Latin America. Inside the aquarium is a botanical garden with more than 75 species of trees, a frog pond with about 120 frogs, a crocodile preserve, and an aviary. If you like to feel strong emotions, then you can swim with sharks and stingrays. Another place where you'll find fun is at Mazagua Water Park, with slides, slides and pools. If you are looking for extreme sports, you should visit Huana Coa, a park with zip-lines and hiking trails that you can explore on an ATV. Visit Stone Island aboard a catamaran, passing by the lighthouse of Cerro del Creston. 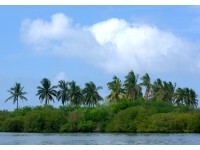 On the island you can enjoy the beach, go horseback riding or kayaking. In the Pacific Pearl you will find lots of options for fun, both in Machado Square and Zona Dorada, where there are modern nightclubs. Around Mazatlan, within approximately 165 kilometers (102.5 mi) is the magical town of Cosalá, combining traditions, popular folklore and colorful colonial buildings on its cobbled streets. There are also several mining museums. Teacapán is a beautiful natural area in the south of the state, where Cañas River flows into. 40 kilometers (24.8 mi) away is El Quelite, a small rural town with farms, cheese factories and traditional haciendas. Mazatlan hosts one of the biggest carnivals in Mexico, the Mazatlan International Carnival, which takes place five days before Ash Wednesday. On the Olas Altas Boardwalk you can the Sinaloan band and drum music, as well as cultural activities such as the Juegos Florales poetry contest. Other festivities include the Jose Limón International Dance Festival in April, the Sinaloa Arts Festival and the Cultural Festival of Mazatlán. The Grand Pacific Triathlon and the Grand Pacific Marathon are held in late November and early December.